It's a fantastic time to be in the market for a Pixel 2 or 2 XL, especially if you're a Verizon customer and live near a Target store. Hot on the heels of a Google Store deal offering $50-75 off the latest Pixel phones, Target is offering a $250 gift card if you activate a Pixel 2 or 2 XL on a new Verizon line or a current one, and Verizon is offering a $300 bill credit spread out over 24 months. That adds up to a rather hefty $550 off Google's latest smartphones, if you're fine with some creative math. Target is also offering a $200 promo if you activate a 32GB Quite Black first-generation Pixel on a new Verizon line or a current one. 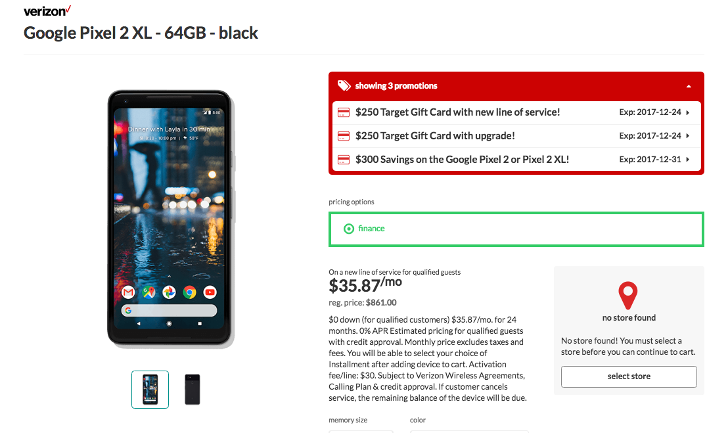 Now for the fine print: The $250 Target gift card for activating or upgrading a Verizon line with a purchased Pixel 2 or 2 XL requires device financing. If you want to take advantage of this promo, you'll have to make sure your order is completed and picked up in a brick-and-mortar Target store by the end of Saturday (December 23rd). The gift card can't be used to pay for this purchase, there's a limit of four per household, and this promo is US-only (sorry, Canada). Target also notes that quantities of this gift card are "limited." The $300 Verizon promo expires Sunday, December 31st. It doesn't require a contract, but it will be applied as a $12.50 monthly bill credit over the course of 24 months. Target is also offering a $200 gift card for activating or upgrading a Verizon line with a 32GB first-gen Pixel in Quite Black. The same terms for the $250 gift card for the Pixel 2 and 2 XL above apply. If you need a refresher on these smartphones, take a look at Ryan's review of the Pixel 2 and 2 XL, as well as David's review of the Pixel and Pixel XL. Those of you who have been patient enough to wait for this kind of deal to drop have been handsomely rewarded. Go on and act quickly.